Consider keeping it close to your kitchen to minimize long trips back and forth. Also allow plenty of room around your patio table for the chairs to pull out comfortably, and think about a space for the grill – with plenty of clearance from the house. Trex® plays well with water, so it’s a great choice for a pool deck – plus our railings can handle the whole family’s wet towels. Just be sure to leave room for a few chaises and a clear path for cannonball jumps into the pool. If you prefer hot tubs, they can be heavy, so it's important that your deck's foundation and framing are built to handle the load. And any yard with a pool requires a fence. Be sure to check local height requirements for fencing around pools. Consider a multi-level deck to create zones for dining, lounging, or even a private space under a pergola. 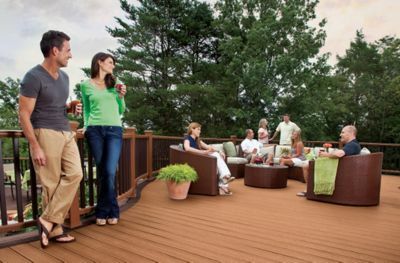 Using more than one decking colour also helps identify one area from another, while different railing colours and styles bring high design to safety. And make sure to plan some uninterrupted room for everything from ball games to a moonlit conga line. 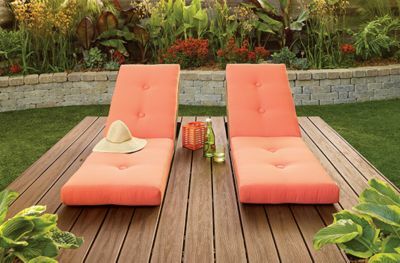 Trex low-maintenance products lend a peaceful, easy feeling to any outdoor oasis. But for decks designed exclusively with unwinding in mind, be sure to leave room for plenty of fully reclined lounge chairs, a shade-enhancing Pergola and refreshment-friendly side tables. 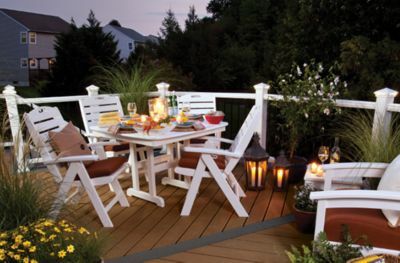 And to get even more from your space, consider adding a cocktail rail to the top of your deck’s perimeter or splinter-free benches built right in. Our ability to create curved decking and railing lets you work around any obstruction and easily maximize an irregular space. Seemingly useless areas can transform into the perfect corner, bench or privacy wall. 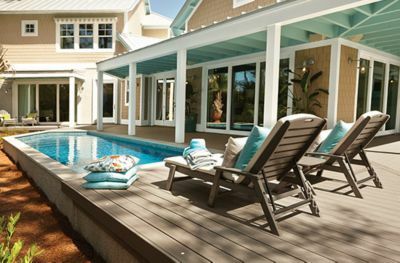 Some spaces welcome the sun – beach and poolside locations come to mind – exactly where decking with our industry-leading fade & stain warranty comes in handy. So you’ll never suffer a summer’s worth of fade marks where the table and doormat used to be. Trex can easily work around existing trees or wooded lots to maximise your garden’s natural shade. Alternately, installing a gazebo or pergola can shoo away the sun over seating areas or dining tables while adding drama to your landscape. How to get from the house to the garden – with lots of beautiful stops in between. Building a low-lying deck amidst landscaping at the end of your yard, for example, creates a new area of interest, while building a deck over difficult terrain can turn a mud pit into your garden’s greatest feature. Multi-level and wraparound deck configurations accommodate lots of friends, invite intrigue, and can create beautiful upstairs / downstairs entry points to both the house and the garden, often making stairs and railing the focal point of your space. Trex® Outdoor Lighting installed along railing and into stair risers keeps night walks safe and amps the drama. When your property allows only one exit point from the house, consider a doorway from the kitchen for an easy path to and from the fridge. And only one staircase? Build on a corner or consider a narrow-to-wide design and line with potted plants.